Reception was closed when we arrived and we had to hunt our key from a glass case with our name on and find our apartment in the dark. The pool was small and you have no privacy as it is about 2 metres from the row of apartments. The rooms were clean enough but we stayed 7 nights and only had the maid in once. We were in no 13 next to restaurant where they start work very early and it’s no good if you fancy a lie in, as it’s very noisy. Rubbish was left outside apartment next door for 2 days which is not very pleasant in the heat. Very hilly. Just returned from a weeks holiday at the club europa, everything was lovely, was pleased with the cleanliness etc. About two days to go the cleaner was in cleaning, I left my wedding and engagement rings on the shelf in my bedroom. As the cleaner left, I went back into the room to get my jewelery and my engagement ring was gone. I immediately approached the cleaner and she angrily dismissed me. As reception only opens for a few hours per day, I went down the following morning to report my missing ring and was told: "No, no, no lady not this complex." They chose to completely ignore me and made no note of my missing ring. I would advise people staying here to be very, very careful with all their valuables at all times. Club Europa was not a good choice for us as we had our four year old son. It's about a 30-40 min walk to the beach, and about 10 mins before you hit the nearest restaurants and pubs. Anyone with slight walking problems should avoid these apts unless you dont intend to leave the very small pool. We were in room 11 which was right at the sunbathing area of the pool, sometimes getting very busy. Also, our room had small cockroaches running about every night, even in the cutlery drawers. I wouldn't return to these apts unless it was a freebie. Also there is no pool bar or late night reception, so make sure you don't lose your keys!! The walls are very thin which makes a good nights sleep non existent as you can hear every noise from all the other apartments!! 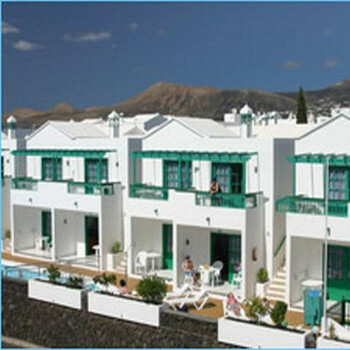 Club Europa is a small apartment block of 27 quite spacious apartments all of which look out over a small but adequate pool. The pool also has a section at the end for children. It is located in a quiet, peaceful part of the harbour area of Puerto del Carmen and is within easy walking distance of bars, restaurants and shops. There is however a bit of an incline on the return walk. Taxis are plentiful and only cost a few euros.